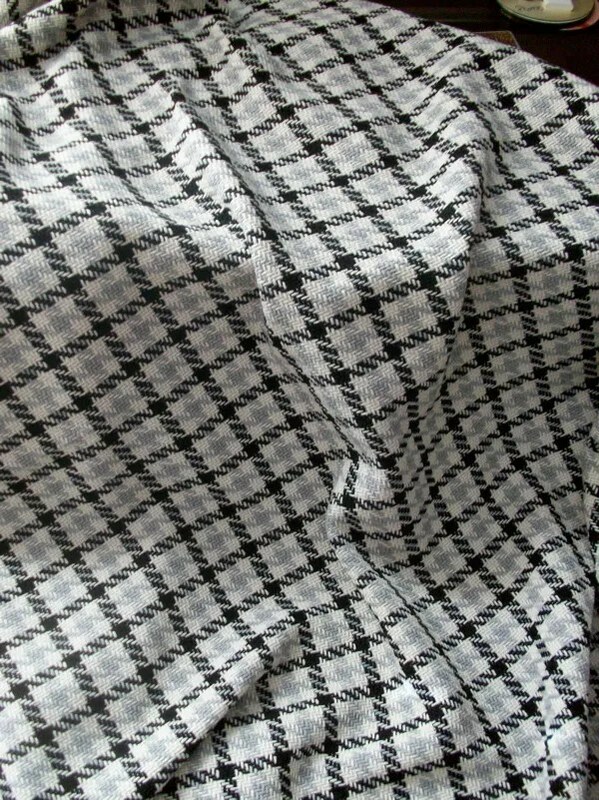 So, here’s the fabric I’d like to use to knock-off the Anthropologie Check Please peacoat. It was a Fashion Fabrics Club purchase from a couple years ago. Isn’t it lovely? And, a nice thematic match? But, I only have two yards and the pattern calls for 3.25. This $10 a yard fabric is left over from an ill-fated attempt at a Burda coat. It was made in the time before blogging and it was so horrible, that even my spendthrift, can’t-you-still-use-that cut-fabric mother told me to let it go. Phyllis thinks if I do a single layer, no bias yoke I might be able to squeeze it in. I’m going to troll around for some black, white or gray wool in the stash that might suffice for the facing too. But, if you bought this too and are willing to sell it off, let a sister know! This weekend I’m visiting a girlfriend on the Eastern Shore and next weekend I’m visiting Trena in DC and Karen in Philly. So, I’m not sure when I’ll have time. But, Imma git her done as the folks say! On another note, how excited am I about this new show? It’s an eight episode special on Sundance following the Buyer at Large for Anthropologie!! Man Shops Globe. It’s fashion, shopping, and travel! I hope you manage to make your length of fabric work for this jacket. It’s a great choice. The fabric is really nice. Maybe a muslin first and using that as your pattern will help? Very lovely! Hope it works out! I LOVE that design and your fabric choice. While looking at all my typical online shops yesterday, I was unable to find something suitable for one for me. You are lucky to have what you’ve got. Have you looked at the layout for this is the magazine? It looks really spread out and I can’t wrap my mind around needing 3+ yards of a 60″ fabric for a cropped coat. You may be able to work it out without needing another fabric. I can’t wait to see what you come up with. Good luck finding more fabric. I can’t bring myself to throw extra fabrics out, either. 3.25 sounds like a lot for this jacket. Although a bias yoke and a hood does eat a lot of fabric I think you can wing it if you find some other fabrics for the facings. I can crank out a jacket out of 1,5 meters (60 inches wide), but then again I am barely higher than a hobbit. Good luck, the style of the jacket is awesome! plaid can be a real headache in and of itself, and being short on yardage will NOT ease the pain. Good luck laying it out! Which pattern are you using? My aunt-a fantastic seamstress-always bought at least 1/4 yard less than the pattern called for and always had enough. Good luck! You can make miracles happen when you’re determined. The navy contrasts on my purple coat weren’t what I intended, but now I think they add so much to the look that I’m glad I didn’t have enough fabric. I am sure your jacket will turn out well. You will figure out if you have enough fabric once you begin laying out the pieces. I am sure you can be creative and make it work. Push those pieces right next to each other so you don’t have any waste!! Love the fabric — I know you’ll make it work! Thank you for the link to the show — wish I had the Sundance Channel, as it looks like a fun show to watch. I hope someone has some spare fabric for your coat. However, if not I’m sure your imagination will come up with a wonderfully creative way to make it work. Tell Karen Hi from me. OK – if I were doing this (and BTW, love the fabric you choose/had and love the pattern), I wouldn’t do the sleeve inset and yoke. It’s a great idea, but it doesn’t show up as much in the plaid as it would in a solid. My thinking is that if I’m going to do all that inset work, I want to show it off. It would be gorgeous in a solid. I would do the plaid straight out – follow the line and style of the original, and go for it, and I’ll bet you can get that out of 2 yrds especially if it’s 60″ which I’m betting it is…you might have to fudge a little on the front facing, but it may just work…can’t wait to see what you decide. If you do all of your facings in a solid fabric, that will help too. You could also go 3/4 length sleeves. You could also try the hood and pocket flaps from a coordinating fabric. Oh, I forgot – you can sometimes piece the facings and make due with less yardage. Are there other pieces you could piece to make it work? I’d follow Birgitte’s advice and lay the muslin out on the fabric. 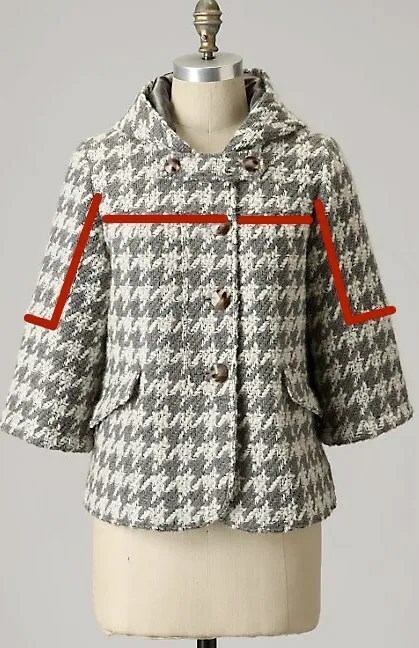 Just the fact that it is a plaid will take a little more fabric than if it were solid. Did you call Kashi and see if he had anything like it? Bring it along with you on Saturday, maybe we’ll be able to find a perfect, coordinating friend for it. What if you used a conrasting fabric with it, like black or gthe gray? I love the fabric you chose!